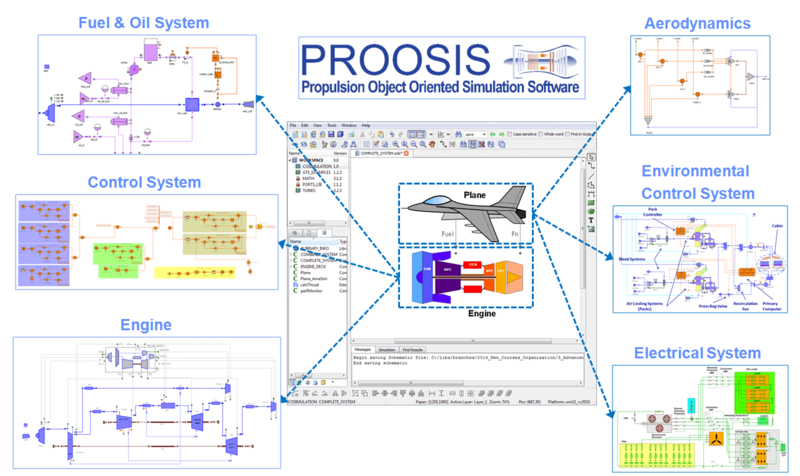 PROOSIS is currently the state-of-the-art tool for advanced gas turbine engine performance and is essentially an acronym for PRopulsion Object Oriented SImulation Software. PROOSIS has all the capabilities of EcosimPro plus some additional capabilities required for simulating aeronautical gas turbines such as performance maps handling, multipoint design tools, design with constraints, export of models using SAE standards, etc. It also provides the TURBO toolkit with typical components for modelling any type of gas turbine. Initially developed within the integrated European FP6 project VIVACE (Value Improvement through a Virtual Aeronautical Collaborative Enterprise), the aim was to build a standard software fulfilling the main requirements from the industrial project partners in the area of gas turbine performance. PROOSIS Version 2.0 was released immediately after completion of the VIVACE project in 2008, and was the first official industrial software ready to be used by companies. PROOSIS was improved further during the European FP7 project CRESCENDO (Collaborative and Robust Engineering using Simulation Capability Enabling Next Design Optimisation), with new capabilities requested by the industry (including Airbus and Snecma among others) in the areas of optimisation, generation of customer decks, extended transient solvers, modelling with constraints, integration of aircraft/engine models. Currently, as the state-of-the-art tool, PROOSIS is being used by a number of aeronautical companies for modelling performance and control of advanced engine configurations (e.g. open rotors). EAI produces new releases annually with many new capabilities requested by the industry to make PROOSIS an internationally recognised, state-of-the-art tool for this kind of modelling and simulation. Versatility: PROOSIS is capable of performing a wide range of engine simulations ranging from specific to generic system requirements (e.g. control, thermal, hydraulic, mechanical, electrical, advanced thermodynamic cycles like Organic Rankine Cycle, etc.). Since PROOSIS is a multidisciplinary simulation platform, a gas turbine can be simulated either in isolation or jointly with other related systems: the control system, fuel system, Environmental Control System, electrical system, etc. The software has also been used to simulate integrated aircraft-power plant systems (Fixed and Rotary wing concepts) and further used to optimise different engine/aircraft parameters according to the required mission. 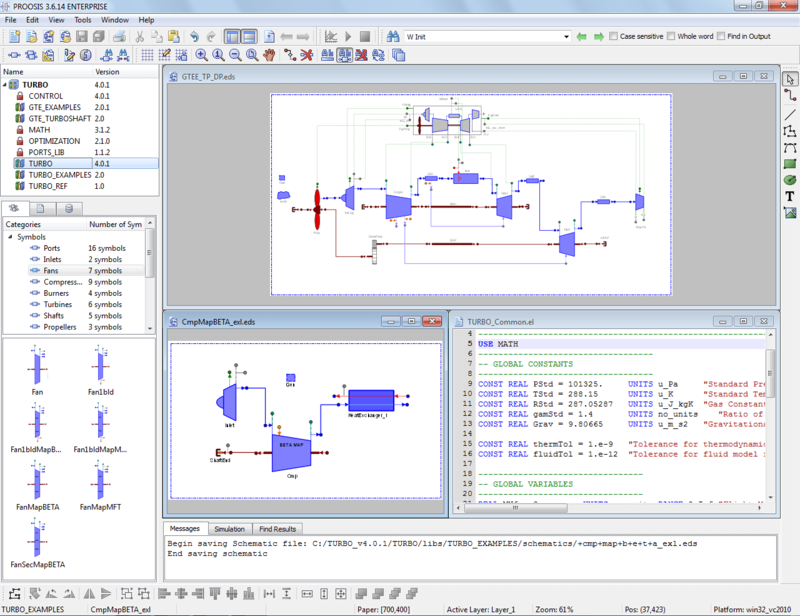 User interface and deck generation: It features an advanced graphical user interface allowing for modular model building using either the standard or any custom library of engine components (as seen in Figure). The software also has advanced capabilities in customer deck generation wherein models may be exported as standalone encrypted modules (black-boxes). The generated decks are produced according to the international SAE standards for gas turbines (ARP4868 and AS4191). The decks can be used by external users (customers) for any kind of calculation (parametric, sizing, transients, etc.). The decks can also be integrated in other tools using either FORTRAN or C/C++ languages. Modelling flexibility: The gas turbine modelling capabilities of the software rely on the TURBO library of components. The TURBO library has been built taking advantage of the object-oriented technique. This enables obtaining an extremely flexible and detailed library of components, which can be extended with new components or physical models if necessary. 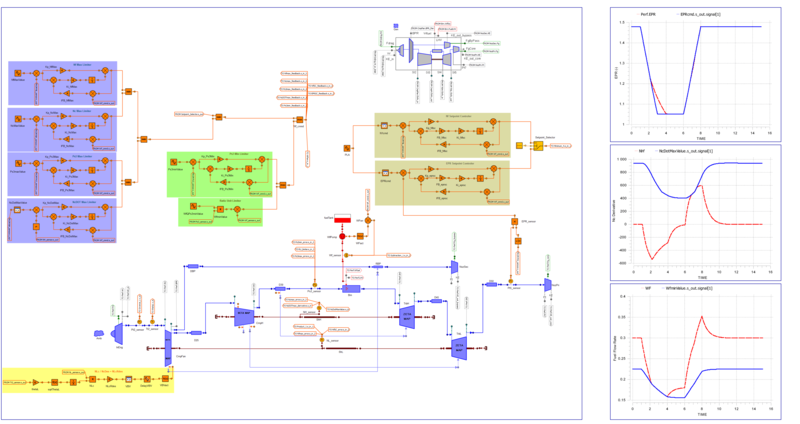 This provides flexibility in modelling different engine architectures by simply dragging and dropping the components into the schematic canvas. Performance prediction and simulation: PROOSIS possesses capabilities to undertake a wide range of simulations at design point, off-design conditions at steady state and/or in transient. The software can also be used to extensively explore the design search space through parametric analysis, sensitivity studies and optimisation. One additional and significant capability of the software is the ability to execute multi-point design calculations to which complex additional constraints (engine rating) can be added, is worth noting. Transient performance simulation: PROOSIS includes advanced transient simulation capabilities, based on powerful solvers. This allows simulating any transient operation of the gas turbine (i.e. changes in the rating condition, changes in flight conditions, mission simulation) with the possibility of including additional constraints or operation limiters (“extended transient”). 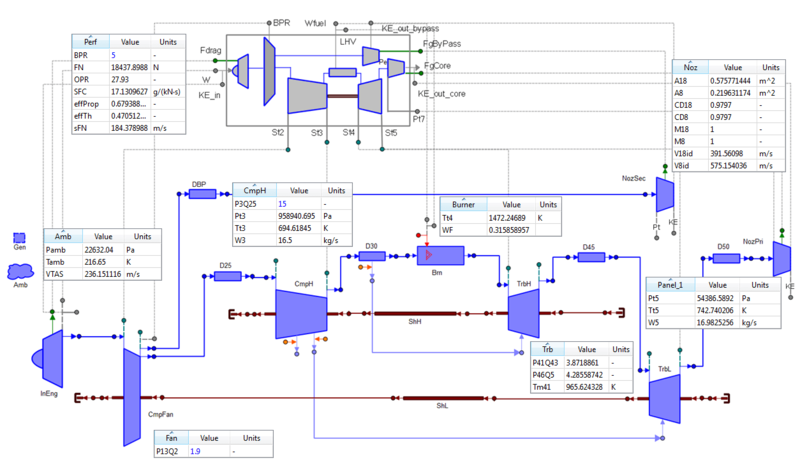 The transient simulations of the engine can additionally also include an integrated control system wherein the whole control logic for setting the power management and protection logic can be included. Connectivity with other engineering tools: One of the key features of PROOSIS is its built-in ability to connect with other engineering tools. Models developed may therefore be connected with other software (e.g. Matlab/SIMULINK, MS-Excel, ISIGHT, MS-Visual Basic etc.). Additionally PROOSIS models can also be translated into C++ code, which can be reused in other C++ applications. Distributed/parallel simulations. In order to reduce computational time of iterative calculations (e.g. required while using evolutionary algorithms for optimisation) a very important feature of PROOSIS is the flexibility to enable the setting up of parallel or distributed multiprocessing environments. Advanced solvers: The available internal solvers in PROOSIS allow dealing with stiff or non-stiff dynamic problems (DASSL, RK4 and Adams-Moulton). The algebraic problems are solved by an improved Powell’s hybrid based method. Inequality groups (conditional equations or limiters) can be used in both steady and transient simulations. Additionally, several optimisation solvers are also included which enable undertaking parametric optimisation, dynamic optimisation, and system identification problems. Specialised and additional capabilities of suite of advanced solvers: Convergence issues can be debugged with the help of the simulation log produced during the simulation, in which the evolution of the variables, residues, Jacobian matrix, simulation errors and statistics are shown in HTML format. For all the solvers, basic and advanced configuration parameters can be managed, in order to deal with convergence issues. Additionally, low level access to all the solvers and mathematical processes in PROOSIS allows extending its functionalities with external (commercial, in-house) numerical solvers. Non-linear problems like those arising when computing the gas turbine steady performance or in design point calculations are tackled in PROOSIS with an extended and improved version of the well-known MINPACK solver, which implements Powell’s hybrid method. This consists of a hybrid approach between the Newton’s and steepest descent methods, and the Broyden technique to improve the method’s efficiency. A wide range of configuration parameters is available to the user for fine tuning the solver when convergence issues arise, or for dealing with poorly conditioned problems. A global search differential evolution solver is included in the Optimisation Toolbox, as well as interfaces with well-known Sequential Quadratic Programming solvers (included large, sparse problems solvers) and Interior Point solvers. Dynamic optimisation problems are solved by means of direct methods, such as single shooting, adaptive time single shooting and horizon control techniques. TURBO Library: A complete library with more than 70 typical components for building 1D performance models of aeronautical gas turbines and their components, such as compressors, turbines, shafts and heat exchangers. The library is provided in source format so that the user can customise any component or create new components based on existing ones (eg, by using inheritance). GTE_EXAMPLES Library: An illustrative library containing typical engine configuration models (turbojet, turbofan, etc) built with the TURBO library. It also includes typical calculations for design, off-design, transient and steady-state calculations, among others. 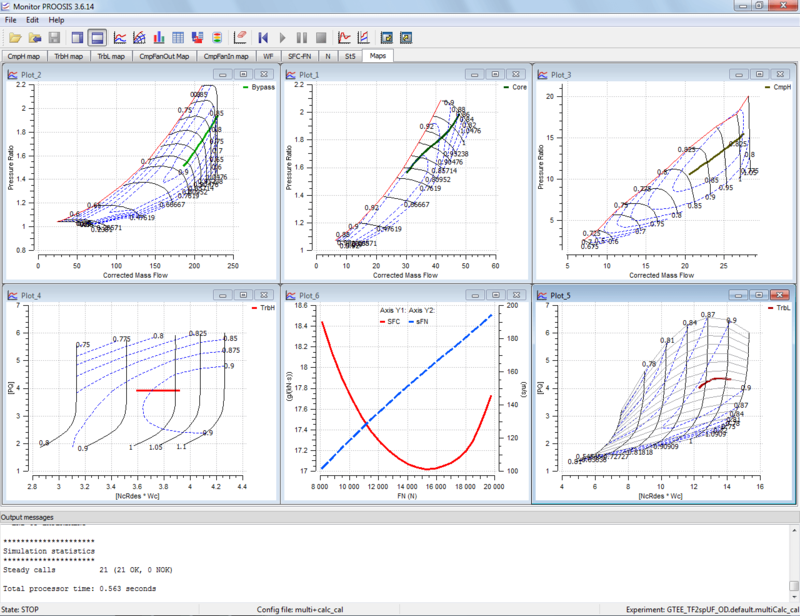 Sophisticated wizard for creating mathematical design models with capabilities for working at several working points (take-off, landing, etc), defining design variables, closure equations and inequalities, etc. Wizard for sensitivity analysis, which lets the user study the sensitivity of any output variable when other input variables are modified. MAP class for handling all compressor, turbine, etc, maps with all performance data stored in XML format. The behaviour of the compressors and turbines can be described with BETA and MFT maps. Map visualisation: Maps can be visualised when running simulations, showing the results over the compressor map (efficiency, surge and rotational speed lines are also drawn). 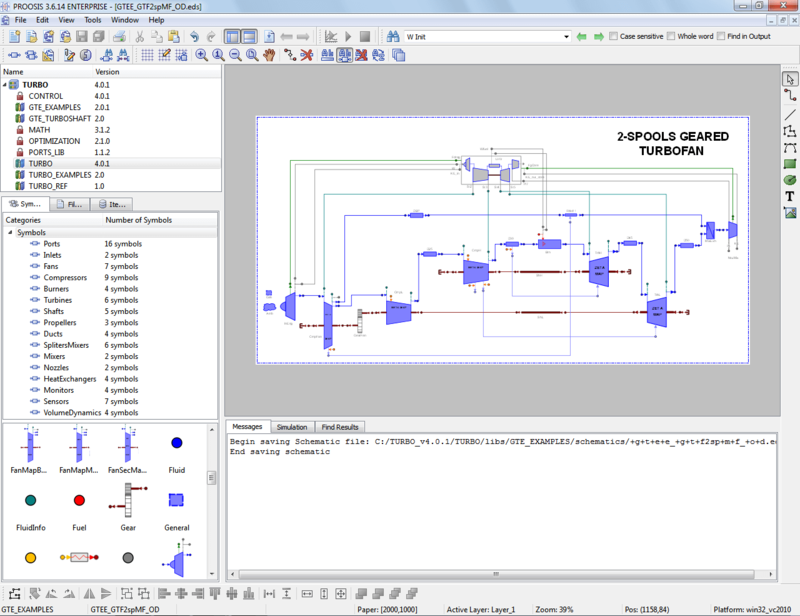 A customer deck generation tool exporting any engine model as a black box in a dynamic library (.dll) following the international standard ARP4868 for Gas Turbines. The deck can be reused later either programatically (in C, C++, FORTRAN) or as an executable. All map information is provided encapsulated and encrypted.